Everywhere I go, it seems, that beer seems to be synonymous with biking, and more specifically mountain biking. It's almost like a bunch of ex-Hashers (Hash House Harriers), similar to my own plight, decided that running was no longer their thing but they want to stay fit and still take to the woods, so they turned to mountain biking. This love of beer, specifically micros, is adherent in many blogs such as bikesandbeer which I just started following not just because of the beer but the author rides a 29er; another blog, MountainBikeBill.com has a great post on riding and then finishing up with a nice Stout; The Go Clipless blog even has a category for beer. Seems like beer and mountain biking go hand-in-hand. Many of the mountain bikers I know tend to seek new micro-brews as passionately as they do epic singletrack. And if that is not enough proof, here is a little vid I found on the TomiCog blog that I think is also a pretty good example of mountain bikers (single speeders in fact) and our love for beer. There is a lot of drinking going on and I don't think they are drinking energy drinks from those water bottles. 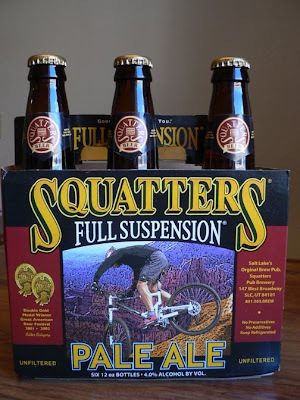 Then there is beer specifically named with mountain biking in mind like this one from Utah of all places, Squatters Full Suspension. Hope it's not 3.2%. Nice write on the suds from the Michigan Beer Buzz website. Not directly related to mountain biking is Fat Tire Amber Ale and from The Pike Brewing Company comes Tandem Ale found in a post on Bike Hugger.com. Besides beer, there happens to be quite a few bike related products designed to help you fix the bike and open a bottle of beer. Over at Wheel and Sprocket, an online biking and eBay store, they are now selling what they call a the New Fixed Gear Tool. Pretty cool idea but I am not sure I would want something like that on my mountain bike. Fixed gear or single speed commuter with a track hub in the rear for sure. I wonder if it could be used like a Peanut Butter Wrench. 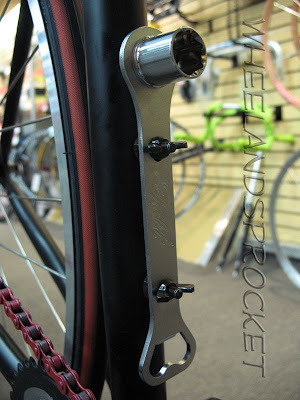 And don't forget some of their handy multipurpose bike tools, too! Of course, you have some DIYs, too, and only in France might you see a cork screw, bottle opener combination. Not to mention the myriad of bottle openers from the tool manufacturers such as Pedros and Park Tools that I found a site called Bicycling Bottle Openers. And don't forget bike frames with built in bottle openers, such as my very own Qball and the Santa Cruz Heckler. One of the reasons I got the Qball was for the bottle opener! I imagine there are even more beer/biking related products available. If you know of something unique that I haven't covered, please post a comment with a link. Is there really a better combo? No there's not. Think about all those non-beer lovers and what they are missing. 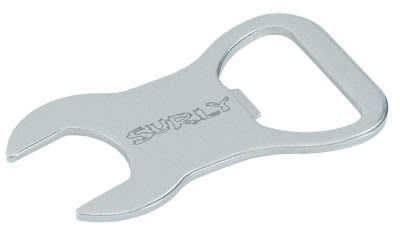 You need to post a picture of your bottle opener in action. I thought I had one of the Qball but I couldn't find it.